Journaling can be both educational and therapeutic for kids. It’s more than just a way to practice writing; it allows kids to reflect on their emotions, an important process and something they might not ordinarily do. Getting a kid to start a journal, especially if they aren’t crazy about writing, can be a tough sell. Emphasize the open-ended nature of the project. It’s their journal and they can fill it with anything they want. If they want to write about things they saw on TV or their favorite videogame, let them. It doesn’t have to be full sentences. There can be doodles. No limits or minimums on entry length. The only rule? Date all entries. When first introducing the idea of journaling to your child, it can help to show them a few inspiring examples. There are many great children’s books on the subject of journaling, and even more fiction books, for all reading levels, written in diary format. If you kept a journal as a kid, dig it up and show it off to your child; it might be more inspirational than you think. Also, having a cool journal can be a booster to get started. Although you should encourage your child to share their journal with you if they want, be sure they know they can also choose to keep it private. Part of growing up is deciding what problems to share with parents and which ones to tackle yourself. A journal is a safe space to grapple with those problems and deliberate over solutions. It’s also a space for thoughts they might never say aloud to anybody, not even a parent. If a kid fears their journal may become public, they will not be honest, which defeats the point of journaling. One of the best things about journaling is that it can become a lifelong project. Some people start keeping a diary in first grade and by the time they graduate college have a thorough record of their lives. 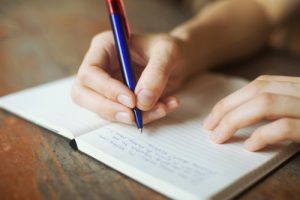 Other people return to journaling in times of stress, as it helps them work through difficult times. Even if your child doesn’t keep a diary every day for the rest of their lives, you will have taught them an important lesson on recording and organizing their thoughts and emotions.